Have you ever wanted to try your hand at clay? Have friends in town and need a fun activity? If any of these answers are yes, then Art by Appointment at The Bascom's Dave Drake Studio Barn is perfect for you! 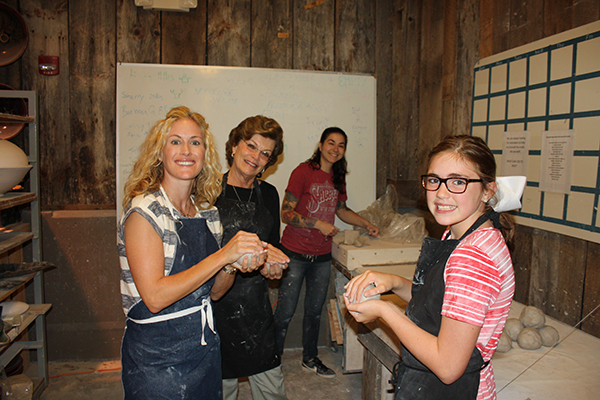 Pick a time slot, wear some old clothes and we will provide a knowledgeable instructor who will guide you through the process of either hand building or the potter’s wheel. Pieces will be ready 3 weeks after date of appointment. The Bascom is located in Highlands, North Carolina. TheBascom focuses on providing excellent exhibitions, free of charge; a robust education department with art classes for people of all ages; and an expansive outreach program consisting of numerous partnerships with local nonprofit organizations. For more information about The Bascom please visit www.thebascom.org or call 828-526-4949. Visit us in person at 323 Frankllin Road, Highlands, NC. The Bascom is just across the covered bridge! Cashiers411.com is a comprehensive online community calendar for events in the Cashiers Area mountain communities of Cashiers, Glenville, Highlands, Sapphire and Lake Toxaway and nearby western North Carolina towns of Cherokee, Cullowhee, Dillsboro, Franklin, and Sylva. The calendar is hosted and maintained by the Cashiers Area Chamber of Commerce as an Information Source for the community. The Cashiers Area Chamber of Commerce represents the business, economic and community development efforts of the Western North Carolina communities of Cashiers, Glenville, Sapphire and Lake Toxaway. Cashiers, along with Cherokee, Dillsboro and Sylva, is part of Jackson County's "Play On" tourism initiative. Destination Cashiers highlights all the things that make this area a great vacation destination in North Carolina!